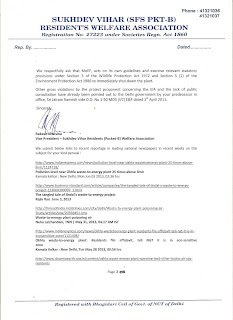 New Delhi, June 22, 2013: In a letter to Jayanthi Natarajan, Union Minister of Environment and Forests, residents of Okhla complained against the operation of municipal waste based power plant within the eco-sensitive zone of the Okhla Bird Sanctuary and Wildlife Park and sought its immediate closure. The letter is enclosed. 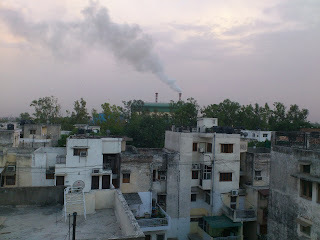 This power plant of M/s Jindal Urban Infrastructure Limited (JUIL), a company of M/s Jindal Saw Group Limited owned by Prithviraj Jindal part of O P Jindal Group is facing bitter opposition from residents, environmental groups and waste pickers and it is facing a case from Sukhdev Vihar Residents Welfare Association in the National Green Tribunal. The plant is situated not only in the proximity of New Friends Colony, Maharani Bagh, Sukhdev Vihar and the business district Nehru Place - but also several prominent institutions, including hospitals like Apollo, Escorts and Holy Family and Jamia Milia Islamia. Disregarding the vulnerability of these areas, this power plant has come up deploying unapproved Chinese technology and in violation of all the relevant environmental regulations and rules. It is connivance or collusion in the face of such violations that lead to preventable disasters. This plant falls within two km of the Okhla Bird Sanctuary and Wildlife Park (OBS-WP). The plant does not have the mandatory clearances from the National Board for Wildlife. 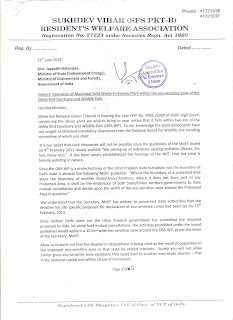 The letter says, “It is our belief that such clearances will not be possible since the guidelines of the MoEF issued on 9th February 2011 clearly prohibit “the setting up of industries causing pollution (Water, Air, Soil, Noise etc).” It has been established at the NGT that the plant is heavily polluting in nature. The location of the plant in a Eco Sensitive Zone which is a protected area of the Uttar Pradesh state abuts into the boundary of Delhi state. This attracts the following MoEF guideline: "Where the boundary of a protected area abuts the boundary of another State/Union Territory, where it does not form part of any Protected Area, it shall be the endeavour of both State/Union territory governments to have mutual consultation and decide upon the width of the eco-sensitive zone around the Protected Area in question.” In the case of Jindal’s power plant in question this has not been done. 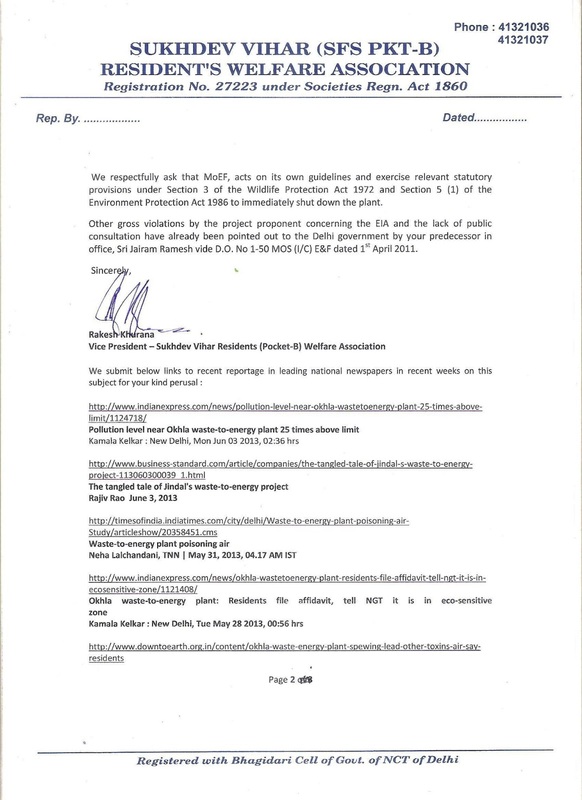 Since neither Delhi state nor the Uttar Pradesh government has submitted the required proposals to date, let alone hold mutual consultations, the activities prohibited under the issued guidelines would apply in a 10 km–wide eco-sensitive zone around the OBS-WP, as per the letter of the Secretary, MoEF. 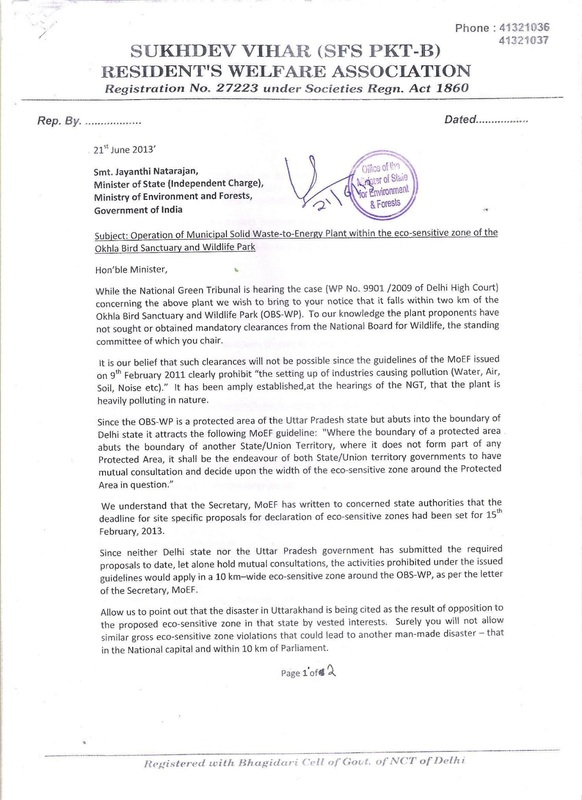 Residents point out in their letter that “the disaster in Uttarakhand is being cited as the result of opposition to the proposed eco-sensitive zone in that state by vested interests. Surely you will not allow similar gross eco-sensitive zone violations that could lead to another man-made disaster – that in the National capital and within 10 km of Parliament. The project proponent concerning the EIA and the lack of public consultation have already been pointed out to the Delhi government by Jairam Ramesh vide D.O. No 1-50 MOS (I/C) E&F dated 1st April 2011 in his stint as environment minister. A report of a committee headed by chairman, Central Pollution Control Board (CPCB) has also underlined the violations including absence of industrial disaster management plan. ToxicsWatch Alliance (TWA) has been campaigning against the plant since March 2005 when it was first proposed.